So much to do, so little time — or so it seems. I’ve been knitting away on all sorts of things, mostly from the Pile of Unfinished Knitting, but I did stop and make a Sweet Fern hat to match my Sweet Fern mitts. I love how the set turned out! There might even be a scarf’s worth of yarn left over. A small, narrow scarf, but that would do. I made the hat by spacing five of the cables around the brim, knitting them upside down. Then I turned at the end of a round and knit back in the other direction, so the cables would be on the outside when the brim is folded up. It’s hard to explain, but once you do it, it makes sense. The yarn is Riihivilla Aarni, dyed with Indigo. The other night I pulled out my Whimsy Lace Scarf, which has been weeping softly from the bottom of the knitting basket. I haven’t worked on it since February, when chemotherapy finally took any remaining ability to concentrate or count. It’s such a nice scarf, and beautiful yarn. It holds a lot of sad energy, though, and there are even places in the knitting that show my distraction. I’ve decided to give it only happy attention from now on, and the sad bits will fade. My Levi socks have also come out of the bag again. I’m on the cuff of the second sock, and I’ll cart it around with me for the next little while. I’ll be wearing the pair before long. I spent most of Sunday sorting and straightening my closet, and that pleases me. I needed to get into the bins of yarn so I could pick things to bring to the Stash Lounge at the KR Retreat next week. I ended up with two big bags of nice yarn, including all the Elann solid colored sock yarn I got a few years ago. I haven’t used a bit of it. There’s also a sweater’s worth of Elann Peruvian worsted. I’m sure they’ll find new homes with happy knitters! I also dove into the bag of Sundara yarns, but all I did there was marvel and ponder and swoon, as usual, and decide that my next socks must be Brambleberry. Or maybe Through the Woods, or Pie in the Pantry. Oh, I don’t know! I did have a good idea, though. As I was looking through the mountains of sock yarn, I set aside any skeins that would look good as a plain pair of socks. Now, when I get the urge to start something new, I can reach in the bag and grab a no-brainer yarn for a pair of no-brainer socks. Wait — where did I put that bag, anyway? I have to keep looking ahead now — the Retreat is in a week, and I have lots to do and sort and plan. My car is all clean, has a new battery, and is ready to go. The yarn is bagged, and I’ve begun to decide what to pack. It’s even time to start checking the weather report for Williamstown, MA. I’m excited about getting away for a few days, especially because I’ll be spending time with some of my favorite people in the whole world — my knitting peeps! I can't wait! My stash lounge yarn has been set aside and my "to pack" list has been written. See you soon! LOL about where the bag might've gone! 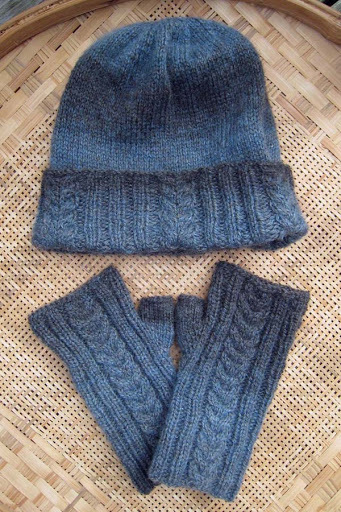 I do love my Meilenweit for making wonderfully uncomplicated socks (because of the yarn's patterning, sock patterning would be excessive usually).The hat and mitts turned out great! Weather in the Berkshires not looking too bad for you (too warm to snow–we'll take it!). Have a wonderful time at retreat, Jane, and please give Clara, Rosi and yourself a hug for me? It's good to see everything going so well for you! The hat and the mitts are perfect together. No-brainer socks in a no-brainer yarn is my comfort knitting for those crazy days. And this knitting peep cannot WAIT to see you! I love your Sweet Fern hat, too. Makes me smile. That Riihivilla is so gorgeous!!! I am very very excited to be seeing you and everyone else in just one week! I'm heading up to my stash room(s) today to sort for the Retreat. I am soooo excited to be back in the same room as my KR knitters. Love the hat. Great idea on the brim flipping. sending you many joyful thoughts for the upcoming retreat! You've come so very far since last year this time, and it is very much cause to celebrate.Have a fabulous time with the peeps, and have Clara hug you from me. So, I assume you changed up the pattern for the Sweet Fern Hat, or was the pattern written that way? I love the way the cables are on the turned up brim. Clever you! Are you wearing your new hat and mitt set to the retreat? Hope you're having a wonderful time, how could you not? I have a bowl in my dining room full of sock yarn, I couldn't stand having to dig around for it when I needed/wanted it! I have to do a huge yarn sort and sift this fall, I'm almost afraid of what I'll find.Hope to see you soon. I can't wait to see you there, Jane! And I love the hat with the mitts. I need to make more hats for Mom, STAT! Ah…by now you're safely at the retreat having a wonderful time! When you get back you should show us your Sundara stash…so we can ponder and swoon! Hi Jane! Hope you had a wonderful time at the retreat. Hopefully it didn't tire you out too much. I wanted to be sure you saw the yarn giveaway on my blog. You might not be interested in such a "novelty" yarn, but since you were away I wanted to be sure you saw it just in case you wanted to be entered into the drawing (which is the day after Thanksgiving).